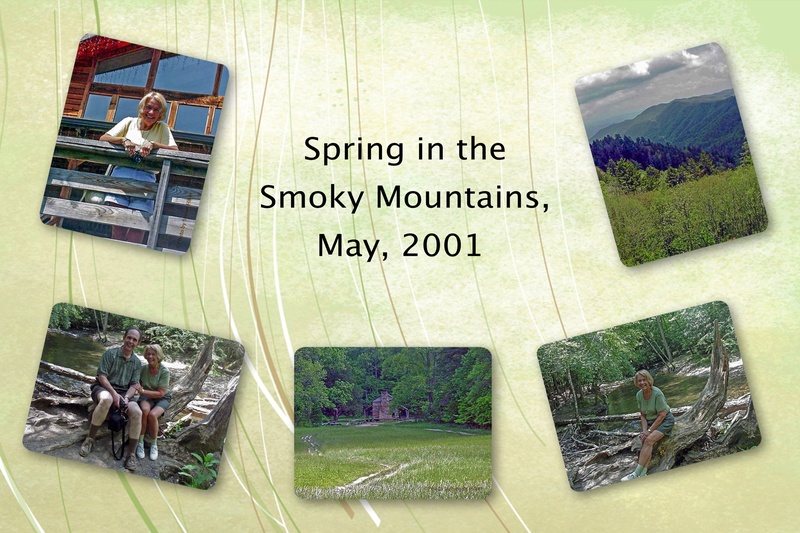 Betsy and I visited the Smoky Mountains in May, 2001. I had never spent much time in the Smokies, but I had an excellent guide since Betsy had visited them when she lived in Tennessee earlier. We very much enjoyed the beautiful green of the mountains and the flowing clear waters of the streams. In the collage above, you see Betsy on the deck of the Wonderland Lodge, where we stayed, on the upper left. A view of Newfound Gap, near the Tennessee/North Carolina border is on the upper right. A nice man took the picture of Betsy and me along Mill Creek in Cades Cove. In the lower center is a photo of the John Oliver cabin, also in Cades Cove. I got the picture of Betsy along Mill Creek which is on the lower right of the collage.